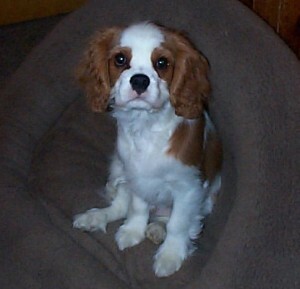 Cavaliers should be tested for inherited eye problems. Hereditary Cataracts can sometimes be seen in dogs as young as 6-9 months of age but may not show until the dog is several years old. A cataract usually leads to some loss of vision. Multi-focal Retinal Dysplasia (MRD) can be diagnosed in puppies from 5 weeks of age onwards. The effect on vision depends upon the extent of the problem. A few MRD folds are a minor defect for a pet owner not wishing to breed, but severe MRD with retinal detachment is a serious problem. Other conditions which may be inherited are dry eye, a common problem in older Cavaliers, distichia (a row of extra eyelashes) and microphthalmia (smallness of the eye or eyes).